The menopause is a time of enormous hormonal change in a woman’s body. One effect of all this means women may find the exercise strategies they used to keep healthy in their 30s and 40s no longer work so well once they hit their 50s. Exercise is often thought of as a one size fits all scenario, but in reality, as our bodies change throughout life, our exercise regime will need to change to suit our needs. Our evidence-based approach is orientated towards the Personalised Health approach which treats you as an individual and takes a tailored approach considerate of your unique physiology. We aim to provide you with actionable knowledge and tips to help you on your journey to optimal health. 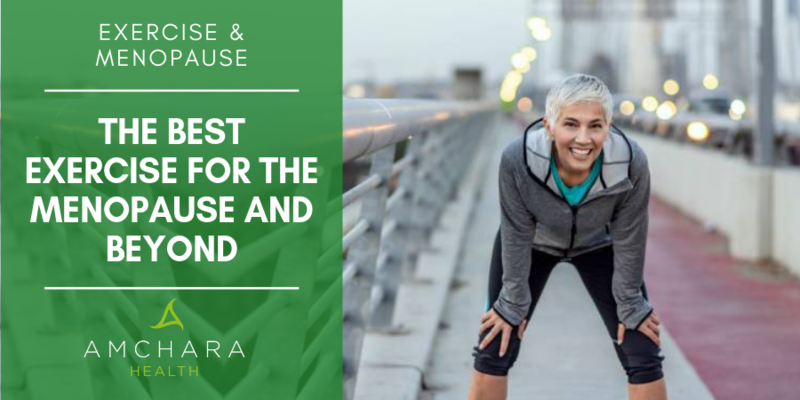 In this article, we’ll look at the types of exercise which can be beneficial for women through the menopause and beyond. Contrary to much of what is commonly perceived about this period of life, the menopause is not a time to be dreaded - it is a time of change and a natural part of life. However, with hormones in their most rapid flux since pregnancy or puberty, it’s no wonder women sometimes don’t feel themselves. Levels of oestrogen, progesterone and testosterone fall, whereas the levels of the stress hormone cortisol often rise. These hormonal changes can cause sleep disruptions, lack of energy, mood alterations and weight fluctuations. As with any change, the effects of the menopause can cause stress and anxiety. In fact, women sometimes comment they feel as if they no longer know their own body. The many positive effects of exercise are well documented. Exercise has been shown to cause the release of endorphins, the happy hormones, promote restful sleep, normalise hormone levels and boost libido, all of which can be very useful after the menopause. All women experience menopause in a different way but one of the biggest contributions exercise can make is the relief of stress. The stress of menopause can contribute towards weight gain as well as hot flushes and anxiety. Exercise has been found to lower the level of the stress hormone cortisol. One study found a 16-week exercise programme including exercising on a bike, treadmill, cross trainer and rowing machine reduced the incidence and intensity of hot flushes. Exercise also beneficially altered the body’s physiological responses which accompanied a hot flush (1). One physical change noticed by women as they adjust to the menopause is a decrease in muscle strength. Oestrogen plays a key role in the production of collagen, a protein which provides a support matrix, or scaffolding, for anything structural in the body - the bones, skin, tendons, ligaments and also the muscles. Lower levels of testosterone may also predispose women to reduced muscle mass. It’s estimated in the first five years of the menopause a woman loses 30% of her collagen, slowing thereafter to 2% per year (2). Women may notice wrinkles and lines becoming deeper and more pronounced, while skin can seem to hang a bit looser on the body. There’s no magic pill to replace lost collagen, although many supplements claim to restore collagen to the body. Nutritionally, it’s a good idea to ensure you’re consuming sufficient protein, as our bodies manufacture collagen from protein. In tandem with this reduction in collagen, women naturally experience reduced muscle strength as a result of the ageing process. Strong muscles are important to be able to lift, reach, push and pull with confidence. They also reduce the likelihood of injury and allow faster recovery from physical activity. Exercise is a great way to reduce this loss of muscle mass. As a result of hormonal changes, women’s body cells become less sensitive to insulin, which tends towards weight gain. Added to this, the fall in oestrogen which occurs at the menopause means women tend to gain fat in different places. Rather than accumulating around the hips, fat will gravitate towards the belly (3). Increased belly fat carries with it a higher risk of heart disease and Type 2 diabetes. The fat can deposit relatively rapidly and can be difficult to reduce. So any exercise regime which raises metabolic rate will be useful in reducing fat deposits. As a consequence of the muscle loss which occurs after menopause, women can gain a higher percentage of body fat. Muscle tissue uses over five times the quantity of calories – one pound of skeletal muscle burns an average of just over six calories per hour, while the same amount of fat burns a little over one calorie per hour. Therefore loss of muscle mass leads to a declining metabolic rate. It’s been estimated that every decade your metabolism decreases by between one and two percent, but this decline accelerates after age 50. Bones are formed by the action of cells called osteoblasts, while old bone is broken down by a different type of cell called an osteoclast. After the menopause as oestrogen levels reduce, its protective effect on bone health declines. As a result, bones can become weaker and more prone to fracture. However, when bones are subjected to a heavier-than normal load, such as in weight-bearing exercises, this stimulates the process whereby osteoblasts build more bone. Not only does exercise affect how women experience the menopause, but the menopause affects how we respond to exercise. Although there is not a great deal of research on exercise specifically in relation to perimenopausal and menopausal women, this area is becoming the focus of more interest. Women in their 50s today are increasingly interested in maintaining their health through fitness, being the first generation for whom working out in the gym became accessible and popular. Women who’ve been active for many years will tend to have fixed ideas about the amount and type of exercise which suits them. This can change at menopause, meaning their fitness strategies appear to no longer be working for them. This may because of the natural biological ageing of muscles, blood vessels, tendons and ligaments, but also the hormonal changes associated with the menopause. Let’s have a look at the different types of exercise. Cardio exercise is anything which raises your heart rate. When you’re doing cardio exercises you are burning calories. The NHS recommends we all carry out 150 minutes of moderate intensity or 75 minutes of vigorous intensity aerobic activity a week. Moderate intensity cardio exercise is defined as exercises such as rapid walking, tennis, bike riding or water aerobics. Vigorous intensity exercise includes jogging, skipping, riding a bike on hills, aerobics and swimming laps. Cardio exercises to try include Zumba, dancing, sports such as tennis or badminton or even climbing stairs. Ease into exercise if you’re not used to it to avoid injury. A great start is brisk walking every other day for 20 minutes. This comprises bursts of high intensity exercise where the body is worked hard for between ten seconds to two minutes followed by a rest period. Many women post-menopause shy away from this type of exercise owing to the fear that they will sustain joint damage, when in fact high intensity interval training is an ideal form of exercise for both men and women in their 50s and beyond. Remember though low levels of oestrogen do mean joints take longer to recover, so this type of exercise should be undertaken a maximum of twice per week. HIIT allows you to burn more calories because your muscles continue to use energy after exercise in order to recover (4). Studies have also found HIIT can prevent the reduction in metabolic rate which occurs with ageing, as well as improving bone density, reducing abdominal fat and improving insulin sensitivity. Although the terms are often used interchangeably, resistance training includes exercising with free weights, weight machines and elastic bands, whereas strength training is focussed on increasing muscle strength and generally uses heavier weights. If you’ve never lifted weights before, you are never too old to start. Lifting weights can help boost muscle strength which is invaluable in improving the toned appearance of the body. Resistance training can increase muscle fibre size (5), as well as strengthen the muscles around the joints, which can help joint functioning and reducing injury. An increase in muscle tone from this type of training can slow the decrease in metabolic rate because as we’ve seen muscle is metabolically active. One study in people aged between 61 and 77 found resting metabolic rate increased by almost seven percent after six months of resistance exercise (6). One study found just eight weeks of half hour resistance training sessions five times per week increased lower leg muscle strength in previously sedentary post-menopausal women (7). Resistance training also been linked to higher bone mineral density (8). The amount of load or resistance placed on the bone and muscles is more important for improving bone density than the type of exercise. If you don’t usually lift weights, start with elastic resistance bands or light dumbbell weights and increase the weight slowly. Choose weights which are heavy enough to make you work hard but able to do 12 repetitions. Squats and lunges can keep the large muscles in the leg strong. Lunges are a great challenge to your stability. Reverse lunges strengthen the patterns of movement which control our walking, stair climbing and standing up from a sitting position. Push ups are great because they promote upper body strength, which can help to protect you in the event of a fall. Generally it’s recommended women incorporate strength training at least twice a week, focusing all the muscle groups in the body. Many women neglect flexibility and balance, but they are incredibly important as we get older. Flexibility and balance exercises include yoga, Pilates and Tai Chi. Proprioception is the sense of where your body is in space. So-called proprioception exercises, such as working with a balance board or ball can help to avoid balance issues and falls. Problems with balance can come on gradually and more or less unnoticed but often following a fall not only is there risk of injury but also a knock in confidence. Flexibility and balance exercises can improve the mobility, muscle tone and stability of your lower limbs. Such exercises can also mean you’re better able to carry out higher intensity workouts. Aim to do some sort of flexibility exercise two or three days per week. Always make time for a relaxing stretch after each workout. Studies have shown the best types of exercise post-menopause are a combination of cardio weight-bearing exercise along with strength routines involving weights. Warming up before you exercise helps to avoid injury and post-workout pain. As we get older, we need to devote more time to our warm-up. Aim for at least ten minutes and concentrate on movements which mimic the movements you’re about to do. For example, if you are about to embark on a strength training session, useful warm up exercises could include hip rotations and arm circles. The aim is to get your blood moving and warm up muscles and break a light sweat. The rise in cortisol which often accompanies the menopause can encouraged increased inflammation. This can make women vulnerable to joint and muscle pain following exercise. It’s really important to keep your form correct while exercising – two lunges and squats done correctly are far more worthwhile and carry a reduced risk of injury than ten squats and lunges done with poor form. A warm bath with Epsom salts can help ease aching muscles. Stand, don’t sit. Prolonged sitting is linked to higher levels of fat around the middle as well as the visceral fat which is deposited around our organs (9). Standing rather than sitting will increase the number of calories your body burns. Stand and walk around while you’re on the phone. Do some stretching exercises when you’re watching your favourite TV show. Park a bit further away from where you need to be or get off the bus a stop or two earlier. Take the long way to work from the station. Get out of the lift a couple of floors earlier and walk the rest of the way. As we’ve seen, a variety of different exercises are beneficial to us all but especially to menopausal and post-menopausal women. Plus adding variety to your exercise regime can increase the likelihood you’ll stick to it (10). Above all - enjoy your exercise. Look at it as something you have a golden opportunity to do rather than something you have to do. Exercise is beneficial to health in so many ways, and it’s especially helpful during and after the menopause. Many women notice they feel stronger, more capable and confident after they embark on an exercise programme. However, exercise does place extra demands on the body. A consultation with an experienced Amchara practitioner can provide you with personalised dietary and lifestyle recommendations tailored to your health goals, exercise regime and genetic individuality. We hope you enjoyed this article. Have you changed your exercise regime after the menopause? We’d love to hear your thoughts. With your comments let’s continue the conversation.